On arrival at Changi Airport you will be met at the airport and transferred to your hotel. Rest of the day is at leisure. Room would be available from 1400hrs. We start off at The Singapore River - the lifeline of Singapore where our first immigrants eked out a meager living and saw Singapore transform from an obscure little fishing village to a great seaport. At Clarke Quay, we embark on a journey along the Singapore River in a traditional Bumboat. Admire beautifully restored warehouses that now house chic quayside dining and entertainment spots and the contrasting skyscrapers of the Financial District. 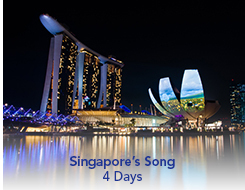 Then marvel at magnificent colonial buildings and five grand old bridges before circling around the Merlion statue, Singapore's tourism icon. Continue on to Chinatown - Raffles on realizing the increasing number of Chinese immigrant decided to reserve this whole area for the Chinese community. We walk along these refurbished and renovated shop-houses, along the narrow streets and see teahouses, medicine shops, acupuncturists, and calligraphers practicing their trades as they have for generations. Next, we proceed to Arab Street - a repository culture for Singapore's Muslim community, with its focal point being the Sultan Mosque. Here, you will find the biggest concentration of Muslim restaurants and shops selling merchandise from all over the Islamic world. These shops are a riot of color, displaying textiles, antiques, jewelry, artifacts and basket-ware. Textile stores are the most prominent, their walls and doorways draped with vibrant rolls of cloths and batiks. As you step into Little India, be prepared for an assault on the senses! You will be greeted by the strong, heady scent of spices and jasmine garlands, followed by the treasure trove of silverware, brassware, wood-carvings and colorful silk saris, dazzling to behold. Stroll along Little India Arcade, Campbell Lane. A narrow pathway through a cluster of restored shop-houses, filled to the brim with Indian clothing, accessories, incense and a rather good Indian sweet shop. At Gardens by the Bay, discover exotic plants in the Flower Domefrom the 5 continents which are displayed in 9 different gardens.Walk in the Cloud Forest and marvel at the 35-metre tall indoor waterfall, a mysterious world veiled in mist with and be amazed at the unique and fragile plants. Watch the SuperTree Grove come alive with an exhilarating display of light and sound at night! Be amazed with a birds-eye view of the city from the top of Marina Bay Sand’s Skypark - it is a roof like no other, perched 200 metres in the air with observation deck in the clouds. Last stop at Lau Pa Sat Festival Village to sample satays (grilled meats on skewer ) with ketupat (rice cakes) in the only satay street in Singapore. A busy street in the day but as night falls, plastic folding tables and chairs are setup along with the burning charcoal fires. Intrigued by the ancient practice of Feng Shui or geomancy? Discover why it’s still very much alive in cosmopolitan Singapore! Our first stop takes us to a Hakka cemetery. Built in the 1800s, it demonstrates how the ancient Chinese had believed in the importance of giving their ancestors a proper final resting place. It was considered the highest form of filial piety which would affect their destiny and ensure continued blessings for future generations. Moving to bustling Orchard Road, we learn about its Feng Shui related buildings and how the previous Teochew cemetery hill is believed to be the land of seven falling stars. Explore an amazing monastery in Toa Payoh and see the semi-circular pond with Nine Water Dragons sprouting “Shui“ or water to deflect “Sha Qi” or negative energy from the nearby highway. Finally, we stop at Singapore’s most iconic building - Marina Bay Sands. Believed to be the hub of prosperity, its many landmarks have been designed to enhance the vibrancy of the new Marina Bay financial district. From the imposing three towers to the oculus at the promenade, learn how these landmarks have been strategically placed to harness the “Qi” or positive energy from the Marina Bay. You will be transferred in time to the airport for your onward flight. Room will be available till 1200N. Price based on minimum 2 Person traveling. Accommodation on sharing basis t choice of hotel. Sightseeing as mentioned in the itinerary on private basis.